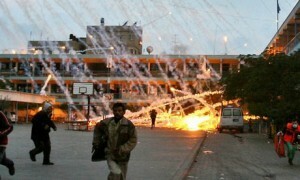 An air strike by Israel on a UN school. The UN Human Rights Council report on the Israel-Gaza massacre war was released on the 15th of September 2009. A 575 page document (pdf) outlining the UN Fact Finding Mission on the Gaza Conflict. This investigation was led by Justice Richard Goldstone, former judge of the Constitutional Court of South Africa and former Prosecutor of the International Criminal Tribunals for the former Yugoslavia and Rwanda. Now, I have not read all 575 pages in detail, merely skimmed through it. From what I read however there is no doubt in my mind that Israel are responsible for committing war crimes in the period from 27 December 2008 and 18 January 2009. The operations were carefully planned in all their phases. Legal opinions and advice were given throughout the planning stages and at certain operational levels during the campaign. There were almost no mistakes made according to the Government of Israel. It is in these circumstances that the Mission concludes that what occurred in just over three weeks at the end of 2008 and the beginning of 2009 was a deliberately disproportionate attack designed to punish, humiliate and terrorize a civilian population, radically diminish its local economic capacity both to work and to provide for itself, and to force upon it an ever increasing sense of dependency and vulnerability. (Page 525). Goldstone’s team looked in detail at 36 incidents during the war. The report found Israel to be in breach of the fourth Geneva Convention. It studied the deaths of 22 members of the Samouni family who, following instructions from Israeli soldiers, were sheltering in a house in Zeitoun, east of Gaza City. The house was then hit by Israeli fire. There were 7 instances where civilians waving white flags were shot while leaving their homes. Direct attack on the al-Quds Hospital. The list goes on. Of course, the confirmation of the use of white phosphorus was also present in this report. Mark Ragev, who some of you may be aware, I am not a fan of, was in this video. He called the UN Human Rights Council a Kangaroo Court, and is of course defending Israel. A Dr Robbie Sabel also featured in this video, a man I will be doing some research on. Seems pro Zionist to me anyway, also talking in defence of Israel. Israel must think the world gullible to continue to deny being responsible of war crimes. As though repeatedly denying it will make this issue disappear. It’s time for Israel to face the music. I do hope that Israel is brought to justice. I am interested to see how the international community will respond to the findings of this report, especially the United States of America and Great Britain. So, I wonder now, is America’s war on terror going to switch to Israel at any point, a nation that is responsible for causing terror, humiliation and committing war crimes in Palestine. Highly unlikely.